The Dec. 19 HBO card from the Turning Point Resort & Casino in New York, that features the intriguing heavyweight clash between American former world title challenger, Bryant Jennings (19-1, 10ko) and unbeaten Cuban defector, Luis Ortiz (23-0, 20ko), has been beefed up with some new additions. Golden Boy chief exec, Oscar De La Hoya, has worked with the broadcaster- as well as other promoters- to add to the card, which now also features former WBA featherweight champ, Nicholas Walters (26-0, 21ko), squaring off against fringe contender, Jason Sosa (18-1-3, 14ko) over 10 rounds at 130 lbs. Also on the bill is a catchweight middleweight (158 lb) clash between former Manny Pacquiao/Miguel Cotto foe, Joshua Clottey (39-4, 22ko) and Philadelphia’s Gabriel Rosado (21-9, 13ko), as well as the 2nd intriguing battle on the bill – at 175 lbs – between Yunieski Gonzalez (16-1) and hard hitting Ukrainian prospect, Vyacheslav Shabranskyy (16-0, 14ko) – who is looked after by Golden Boy. 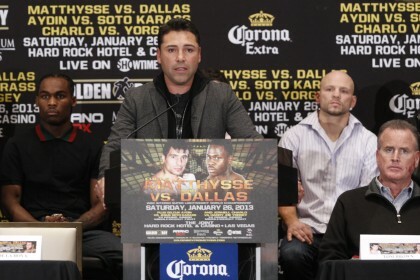 Speaking about the solid light-heavyweight battle between his fighter, Shabranskyy, and Gonzalez – who was controversially beaten by Jean Pascal earlier this year – De La Hoya was optimistic fans could be in for a cracker, as his man secures the route to bigger things. “I like the fights for my guys and I like the card that it’s on,” he said. “It’s a high-profile card and I have high hopes for Yunieski Gonzalez coming off the last fight because I thought he beat Pascal. A lot of people thought he beat Pascal. British fans will keeping fingers crossed that Boxnation pick up the rights to the card, which would be the perfect follow on from the Andy Lee/Billy Joe Saunders card they televise from Manchester earlier that night. Previous boxing news: The Return of Antonio Margarito?